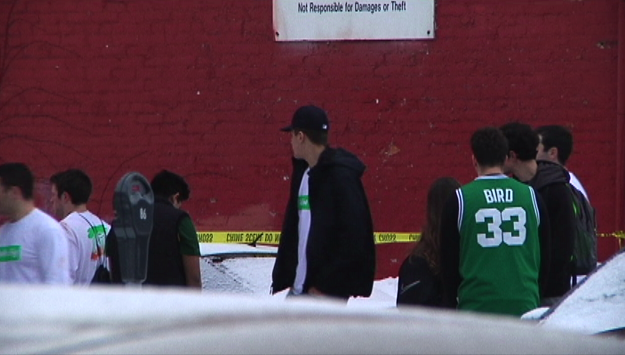 BINGHAMTON, N.Y. -- A college freshman from New York was pronounced dead after falling in an attempt to climb from a fourth floor balcony to a third floor balcony during a fraternity house party, police said, CBS affiliate WBNG reports. The death of 18-year-old Conor Donnelly, of Pearl River, New York, was ruled accidental, according to authorities. “Autopsy findings support that Donnelly had been drinking and it is believed that this was a contributing factor,” said a news release. Shortly after 2 p.m. on Saturday, Binghamton police responded to reports that a man had fallen from a fourth floor balcony. Donnelly was taken to a hospital and pronounced dead. Donnelly, a fraternity pledge, was attending a house party that Alpha Sigma Phi was hosting, according to police. Binghamton University said Monday that the fraternity has been suspended temporarily pending the outcome of an investigation. “Our Dean of Students Office and Case Management Services met with the student’s parents when they arrived and have been providing them support. In the meantime, staff from the University Counseling Center (UCC) continue to provide support and counseling services for students who are affected by this death,” Director of Media and Public Relations Ryan Yarosh said in a statement. The university previously released a statement saying its president, Harvey Stenger, was saddened to announce that Donnelly died accidentally on Saturday while off campus, WBNG reported. Alpha Sigma Phi extended its “deepest sympathies” to Donnelly’s family and friends and said that it was “very saddened” to learn of Donnelly’s death. People in the area felt the impact of Donnelly’s death. “To see that, I would never expect that, I would never walk into work and see something like that, completely unexpected,” said Jeff Vazquez, manager of neighboring restaurant Thai Time. County officials vow to work to keep the community safe. Did fraternity hide evidence in Baruch College hazing death? “As an alumni, as someone who represents this community, as county executive, my heart goes out to the student’s family, and their friends, and the student community,” Broome County Executive Jason Garnar said. “We’re committed to keeping this community as safe as possible, and I think we can certainly do more to do that,” Garnar said. Donnelly’s death is part of a string of deadly incidents in recent weeks involving university students. Earlier this month, a University of Illinois student died in a balcony fall, on what was considered one of the biggest party days on campus, CBS Chicago reported. Jonathon Morales, 23, fell four stories from a balcony at an apartment complex. Last month, a student at the University of Southern Mississippi student fell to his death through a hotel window in New Orleans, the Orleans Parish Coroner’s Office said, CBS affiliate WWL reported. Cole Whaley repeatedly yelled “let’s go swimming” and rammed into the window before it broke, a witness reportedly told police. He fell from an 11th floor room to an outdoor area by the hotel pool on the 4th floor, according to the coroner’s office. Just days before that, a Pennsylvania State University student who had recently joined the ranks of the “Men of Principle at Beta Theta Pi fraternity, was found unconscious inside the Beta Theta Pi fraternity house. The sophomore, 19-year-old Timothy Piazza, later died.